It's refreshing to pass these ads in the NYC subway. Such a welcome respite from the mainstream world of distorted and false beauty. 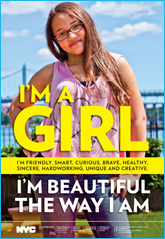 This campaign comes at a time when "girls as young as 6 and 7 are struggling with body image and self-esteem, (over 80% of 10-year-old girls are afraid of being fat and by middle school, 40-70% of girls are dissatisfied with two or more parts of their body)." I applaud this initiative and hope to see more and more of this encouragement in popular culture.